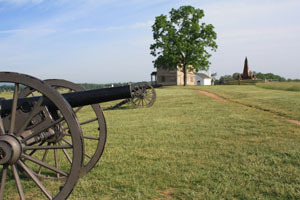 Commemorating the 150th anniversary of the First Battle of Manassas (Bull Run), Manassas, Virginia will recreate a free four-day venue from July 21 to July 24 to relive the 1860s at Camp Manassas, including Civil War Medical Triage, Lincoln-Douglas Debates and Slave Impressions Re-enactment. took place at this spot. General Robert E. Lee’s generals will provide historical dialogue, while the Lincoln-Douglas Debates of 1858 will be performed by re-enactors, playing President Abraham Lincoln and Senator Stephen A. Douglas. In another part of Camp of Manassas, Union and Confederate Cavalries re-enact the First Battle of Manassas and a recreated Civil War medical triage is demonstrated with 1860 doctors and nurses performing amputations and surgeries that were common procedures for wounded Civil War soldiers, complete with horse-drawn ambulance carriages. A slave cabin will be built, alive with slave re-enactors, plowing tobacco and cotton crops, washing, and cooking, as well as a historical narrative on the Underground Railroad. These re-enactments will run regularly throughout the four days. Check www.manassascivilwar.org for a complete timeline of activities. Don Warlick, owner of Secret Passage Ranch in Fort Valley, Virginia, is directing and managing the entire Camp Manassas re-enactment. “I’m working closely with re-enactors and Camp Manassas production crews to create the realism and detail that will captivate and transport visitors back to the 1860s as well as honor the memories of slaves and soldiers who made up the rich history of that time,” Warlick says. Sponsored by Historic Manassas Inc., www.visitmanassas.org, the Camp will showcase an 1860-period gas balloon for observation, telegraph demonstrations and an 1860s embalming display. There will be period children’s games, including target shooting with wooden guns. Re-enactments of period cooking will introduce popular dishes of the times like fry bread (fried corn flour), fatback (back portion of pork), biscuits and peach cobbler on an open fire. Down the road from Camp Manassas, the National Jubilee of Peace, a remarkable moment, when veteran Civil War soldiers met with President Howard Taft on the steps of the Old Courthouse in Old Town Manassas on July 21, 1911as part of a ceremonial peace reunion, will be brought to life on Thurs., July 21, 2011 from 4 p.m. to 5 p.m. The Blue and Gray Ball will also be hosted at the Harris Pavilion on Sat., July 23 at 7 p.m. featuring period dances,with more than 15 instructors teaching popular dances of the time, like the Virginia Reel and The Waltz. www.manassascivilwar.org. Jennie Dean Park is located on 9601Wellington Road, Manassas. Activities are scheduled from 9 a.m. to 8 p.m., Thursday through Saturday, and 9 a.m. to 4 p.m. on Sunday. Read more abut the Peace Jubilee at Striped Pot.